like getting away with it. “Everyone knows where the booze is, Mr. Ness,” warned Officer Malone in David Mamet’s iconic screenplay, The Untouchables, as the federal officers were about to raid a Post Office transhipping point for bootleggers. The judicial system, at least outside of the Temporary Autonomous Zone known as San Jose (aka “TAZ 408”), today has another tool to deal with false innovation in the form of Judge Wilson’s order in the case against “innovator” Gary Fung and his Canadian-based websites. Let it be said that there is an irony to Judge Wilson presiding over the prosecution of Gary Fung and his Canadian-based websites, but I would suggest that the one true irony is not the irony that has been reported in a few places. Judge Wilson also presided over the prosecution of the original Grokster case. The conventional wisdom on the copyleft is that Judge Wilson tried to hand the Grokster “innovators” a favorable ruling that was later (to no one’s surprise) sustained by the 9th Circuit Court of Appeals, but that was still later (also unsurprisingly) reversed by the U.S. Supreme Court in what is now the touchstone copyright infringement case used to go after defendants such as Defendant Fung. The approach is to consider (and, as here, punish) the way that a particular defendant behaved as opposed to attacking the underlying technology. We have no way to actually know what Judge Wilson’s internal process was in Grokster, but my guess was that his initial ruling in favor of the “innovator” in Grokster that became the vehicle for the Supreme Court appeal that reversed him was not going out on a “legal limb” at all. This is probably what the Grokster lawyers would have one believe—or at least would have reporters believe. Another view—arguably a better view–is that Judge Wilson ruled in exactly the appropriate way he should have given the state of the law at the time, the facts before him and particularly the litigants. It is a tribute to his judicial courage that he ruled as he did, probably knowing that there was a substantial likelihood that he would be reversed. And that he would, in his reversal, be handed the decision that he needed in order to rule properly in the Grokster case without fear of being reversed again. In fact, I said at the time that Judge Wilson’s initial ruling (and on remand his subsequent rulings) was precisely accurate, and indeed, courageous as it demonstrated a total faith that the process would work. And so it did. The wheels of justice turn slowly, but they do turn. Quite the opposite of the reportage on the Fung case, Judge Wilson didn’t go out on a “legal limb” in Grokster; he did exactly what he should have done. You only engaged in backslapping and cheering after the trial court decision if you were so disconnected from both legal history and fundamental and ancient jurisprudential principles that you actually though “sharing” with millions of your closest friends was defendable. Reading Judge Wilson’s order granting summary judgment against “entrepreneur” Gary Fung in light of the better view of the history of Grokster, I think past becomes prologue for Defendant Fung. In my experience, and with apologies to counsel it must be said, judges abhor bull. And in both the Grokster case and the Fung case, defendants piled up great, huge, heaping, shovel-ready mounds of it in the judge’s in-box. Because as Officer Malone tells us, everyone knows what’s going on here—judges, most especially, but also everyone else who keeps these cases going. Somebody is trying to get away with it. Someone is trying to escape judgement day. Why? Probably because of the academics who have—so far anyway—no downside risk in demagoguing the issue and who have deluded people like Defendant Fung and the others into believing that somehow this time they will get away with it. The way the game is played is that the “false innovation” of Bit Torrent is used by an operator to set up sites that are visible and most likely to be targeted for trading works of authorship that belong to other people and that are substantially unauthorized. The operator waits to be sued and sometimes never is. The operator—at least before the Pirate Bay convictions—uses any lawsuits as a way to promote itself and get free marketing to attract more users. In the legal trade post-Grokster, operating such sites is known as inducing copyright infringement—or it is very hard to imagine a scenario in which it would not be—and has been ruled illegal in the United States as it has in the Fung case. Normally in these situations, one starts looking for Lessig (who can be counted on to voice his opposition to “what the industry calls piracy” not to be confused with “piracy”). But this time he is merely the vaporware, the ghost in the machine, echoes inside the bubble. No, there is a far more immediate proselytizer at work in his stead. Defendant Fung, from what I have read, operated his servers in Canada. (Canada is a well-known haven for piracy and has been put on the Special 301 watch list by the Obama Administration.) Why Canada? Who advised him to operate from Vancouver? I wonder. The evidence that Defendant Fung had to submit in his defense must be more than a metaphysical passing thought in a tweet by Michael Geist, more than a posting on a Facebook wall, more than an anonymous email—they must prove that which they cannot prove. And they cannot prove it because everyone knows where the booze is. I would also point out the interesting language from Judge Wilson that what had to be rebutted was not an absolute case for actual infringement of each work, but in special cases like that of Defendant Fung, the defendant’s behavior is so bad that the standard is that plaintiffs do not have to bear the burden of demonstrating infringement for each work at issue—just that a substantial percentage of the available files included copyright-infringing or highly likely copyright-infringing content. Because everyone knows where the booze is. And what was not expressly said by the Court is that judges (at least outside of TAZ 408) will not allow their courtrooms to be used to foist onto the law some hack, some weak-minded armwaiving about how Defendant Fung’s enterprises were just like a search engine, were just like Google. Now if Defendant Fung and his fellow travelers had managed to get Google to make a statement or much less file a letter or brief with the Court saying that they were just like Defendant Fung, the implausible commentary would still have been a fine example of bong logic, but it would have been more plausible outside of the dorm rooms of Mirrielees House. Perhaps that kind of statement is to come on appeal, maybe through the Google Policy Fellow being established at the US-Backed Samuelson-Glushko Canadian Internet Policy and Public Interest Clinic associated with Michael Geist, the leading Canadian commentator on Fung. 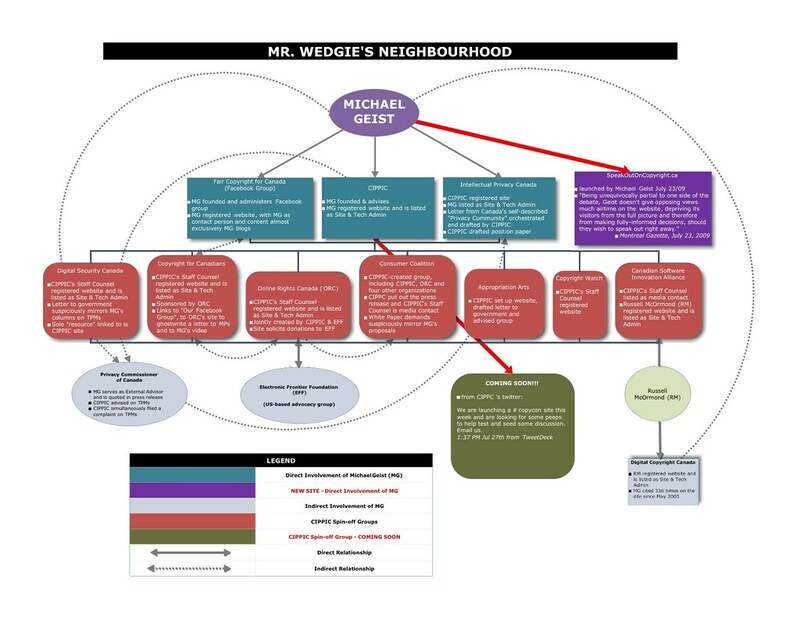 It is so far unclear as to exactly how much involvement Geist has had in the Fung case itself. Actually, that’s the kind of fearmongering so typical of Geist that is simply inapt in this case. That would be true if the “search engines and the like” were engaged in encouraging digital natives to take what doesn’t belong to them. But if the “search engines and the like” are not engaging in the inducing behavior, then they may have something else to worry about, but they don’t have to worry about that which now is of primary concern to Defendant Fung. Geist may want to have a chat with his young fan about toning down the “two wrongs make a right” line of argumentation—it doesn’t work so well with judges–just ask any of the p2p defendants. As Geist told Torrentfreak, a frequent publisher of Geist’s writings and calls to action against the Yanks Under the Bed, “’…most of my P2P downloading tends to be torrents of video files of recent lectures or other video content.’ BitTorrent is his application of choice for downloads.” I’m not quite sure what he meant by “other video content” but it sounds like Geist himself is a good example of a potential customer of Defendant Fung. “[Defendant Fung’s] filing [in a related Canadian case] is well worth reading as it explains BitTorrent technology and argues that [Fung’s] isoHunt is a P2P search engine that merely indexes torrent files found on other indexing sites (it describes itself as a Super-Indexer). So when the facile “search engines and the like” start behaving like Defendant Fung, then they will lose their cases, too. Until then, such analogies should be rejected as the red herrings they are, parading across the stage. However similar the actions of these search engines, it will take access to their internal emails to discover whether their employees shared Defendant Fung’s disdain for the law and actively induced infringement. Perhaps the very well funded Mr. Geist should be doing some Canada research in line with the substantial Industry Canada grants that fund his operations in Ottawa—perhaps some research on Canada’s carbon footprint. (Particularly given the recent insights into hitherto unknown levels of carbon consumption by Google.) It’s certainly not my tax dollars, but it does seem unseemly to put a recipient of the distinguished Canada Research grants in the dubious position of defending a self-admitted international bad boy like Defendant Fung, no matter how attention starved he may be. How exactly is it that a law instructor like Geist, who presumably took an oath at some point to uphold the law, can do anything but openly condemn such behavior? Everyone knows where the booze is, Mr. Geist. “Defendants’ technology is nothing more than old wine in a new bottle…. I haven’t been following the case closely enough to quite be able to quantify the downside for the defendants, but remember that the Isohunt founder is being sued personally. And copyright infringement–especially inducement–has to be done by a person–it doesn’t just happen by itself. So there’s an open question of whether anyone should be allowed to hide behind the corporate veil for bad acts, including inducing infringement. I say again: How many more cases do these pundits have to lose before the entrepreneurs get the idea that the advice is really, seriously, ontologically awful. We now have a sufficient jurisprudence of losers that should allow everyone involved to know bad advice when they hear it, and understand clearly that the person giving the bad advice is not the one who’s going to have the downside of judgement or jail. I cannot imagine why anyone would invest in the development of “innovation” that has consistently been found to be unlawful, not just false innovation. On Larry, on Mikey, on Charlie and Billy, on Johnny, on Freddy–my, don’t you look silly? Merry Christmas to all, and now say goodnight. The cat is deep. Read his stuff. His current post, “Plato and the Internet” is an idea I’ve been working on myself, but am most pleased he beat me to it with an excellent job. In the literature of “Don’t Be Moral” I think we’ll have to include Plato right up there with Google VIP Patry….and our new friend Faza. Bank Accounts/Tax Returns/Accountants: A common mistake that bands make is to have all income paid to one band member, which usually results in unnecessarily complex adjustments at tax time. Check with your bank branch to find out what the bank requires in order to open a bank account in the band’s name (usually at least a “doing business as” or “dba” filing with a government agency of some kind). The band should find an accountant in your geographical area who is familiar with music issues and band accounting and take a meeting with that accountant (preferably a Certified Public Accountant). The band’s accountant should be able to advise you on questions such as the deductibility of expenses (recording sessions, haircuts, meals and travel, cell phones, etc. ); liability issues (not surprisingly, liability issues substantially increase as soon as the band hits the road and starts driving); whether the band should lease or buy that new band van; and how to treat various income streams such as money received from investors, royalty income, merchandise, etc., as well as payment of sales tax, withholding and income tax. Eventually, the accountant will be responsible for paying each band member their draw or salary, and making sure any roadies or other employees are properly paid under state and federal tax laws. Yes, the answer to that “where” question would be very, very insightful. Maybe its the same place they get their funding? What is interesting to MTP about this op-ed is that the writer is Larry Downes, of the Leland Stanford Junior Google School of Law, late home of Lester Lawrence Lessig III. We do not recall a single moment–prior to the departure of The Third One (or “Trip Lessig” as we like to call him) when there was a ray of sunlight between the self-anointed and Google’s sycophants. When the cats away…?